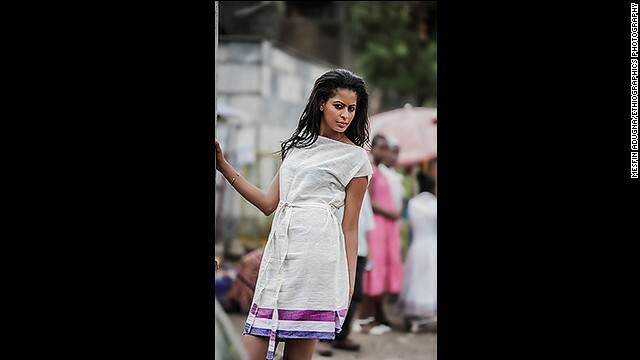 Abugida Fashion is an Ethiopian clothing brand which produces custom-made garments for all occasions. Its designs are a fusion of strong Ethiopian heritage and Western aesthetics. The business was founded by the 22-year-old former model Hiwott Gashaw, who graduated from a top Addis Ababa design school. Her brand also produces belts, bags and baby clothes, as well as blankets and home decor. Abugida Fashion employs six full-time workers, former street girls and elderly beggars who have all been trained in the art of garment-making by Gashaw herself. The designer makes all her products from start to finish, and personally sews the intricate embroidery details to dresses, like the one pictured here. "Abugida means learning something new," says Gashaw, "and with fashion I learn something new every day." Ethiopian garments are usually made out of woolen materials, embellished with vibrant prints and colorful hand stitching. Elegant white dresses are often decorated with bold accents of color. The high cost of machinery and fabric presents one of the biggest challenges for the company, but Gashaw is determined to see her business grow. "I want Abugida Fashion to become a brand like Gucci and to be known all over the world," says Gashaw. 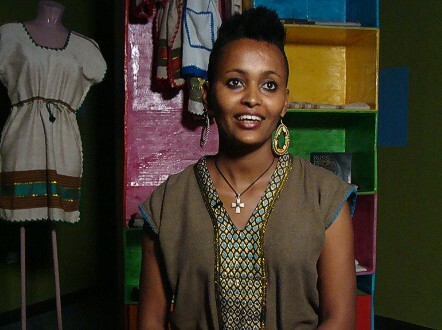 (CNN) -- Making the jump from model to designer seemed like a natural choice for Hiwot Gashaw. Growing up in Ethiopia's capital Addis Ababa, the young entrepreneur always had a passion for fashion, drawing clothes from an early age. Thus, it was no big surprise when in 2012, having already worked as a professional fashion model and after graduating from a top design school, Gashaw took to making her own clothes with the launch of her label, Abugida Fashion. Fusing traditional Ethiopian designs with contemporary Western style, Abugida produces and sells a collection of clothes ranging from women's dresses and scarves to men's designer jackets and children's clothing. "'Abugida' means learning something new," says Gashaw, who started her brand at the age of 22, "and with fashion I learn something new every day." Ethiopian fashion designer Hiwot Gashaw. Ethiopian garments are often created from woolen materials and they're usually traditionally hand stitched. Gashaw, who is involved in the entire process, from designing the outfits to adding the final embroidery details, has continued to use this trend in her intricate creations. "What makes my clothes unique is [that] you can wear them anytime," says Gashaw. "Also, I design and sew them myself, giving them a personal touch." What makes my clothes unique is [that] you can wear them anytime. Based on the outskirts of Addis Ababa, the company has six full-time workers -- former street girls and elderly beggars, who have all been trained by Gashaw herself. "I work with these women who used to be in the streets," says the young designer. "But now I trained them, they work with me and they are able to support themselves." Gashaw cites expensive machinery and tracing raw materials as the main challenges for her startup but says that she will continue using fashion to change the lives of women in her community. Ambitious and determined, the talented designer has high hopes for her brand. "I want Abugida Fashion to become a brand like Gucci and to be known all over the world," she says. Click through the gallery above to see some of Gashaw's creations and check out the video below to find out more about Abugida Fashion.